The premier claims to have welcomed a former EFF member to the ruling party. Gauteng premier David Makhura was highly criticised on social media by actual Economic Freedom Fighters members for claiming a young EFF member had rejoined the African National Congress on Wednesday. 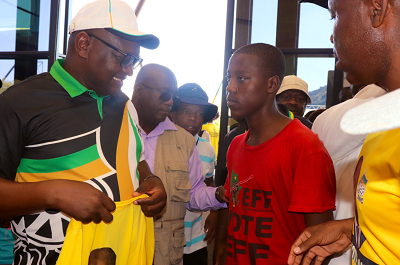 In pictures shared by the Gauteng ANC, the premier can be seen happily helping the sad-looking young man take off his EFF T-shirt. When he changes into an ANC T-shirt, he appears to be smiling, seemingly happy about the decision he’d just taken. “The African National Congress and the Chairperson @David_Makhura welcomes yet another young comrade from the EFF as he rejoins his political home,” wrote Gauteng ANC on Twitter. And when did he originally leave the ANC? At the age of 13???? ?